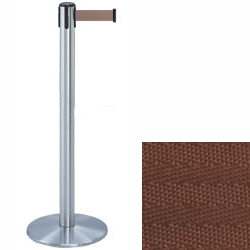 These chrome stanchions with brown belt are great for controlling crowds and forming lines in cafés, event venues and theaters. 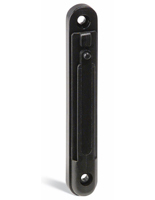 This type of post features a 13' long retractable strap and a stable weighted base for extra stability. 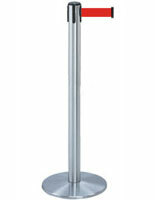 In addition, the chrome stanchions' top feature a 4-way connecting top for attaching to other posts or for fitting accessories like signs. 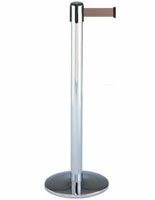 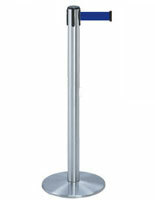 The crowd control stands with a retractable tape measure 38" tall and their weighted base measures 13.5" in diameter. 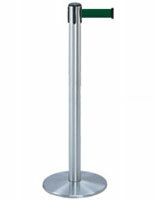 The stanchions for accessories are made of strong metal that can withstand high traffic environments.